Are you looking for one of the best luxury hotels in Jodhpur? Don’t worry. We at Rawla Narlai Heritage Resort are ready to provide our services to you. Make your stay to be worth forever in your life including attractive offers from our Misty Mount Resort. Rawla Narlai is one of the best boutique hotels in Rajasthan. It offers you’re the regal essence with modern amenities to stay. Once hunting lodge Jodhpur’s Royal family, Rawla Narlai Heritage Resort is still owned by the present members of Jodhpur’s Royal family. As it is located between Jodhpur and Udaipur, you can visit many sightseeing places in these two cities. Some sightseeing places of Jodhpur are Mehrangarh Fort, Umaid Bhawan Palace, Mandore Gardens, Clock Tower, Rao Jodha Desert Rock Park etc. Some sightseeing places of Udaipur are City Palace, Jag Mandir – Island Temple, Fateh Sagar Lake, Kumbhalgarh Fort, Bagore Ki Haveli, Ahar Cenotaphs, Lake Palace, Pichola Lake etc. Rawla Narlai Heritage Resort, one of the most famous heritage resorts in Rajasthan, provides the experience to stay at Royal Palace with modern facilities. We at Rawla Narlai Heritage Resort have 32 boutique rooms and suites which are exquisitely decorated. The rooms are classified as follows. Classic Heritage: Almost untouched masterpieces of the heritage resort. A perfect dens for the lover of antiquity. Grand Heritage: You can get the pleasure of living in a room combined with pillars, arches, antique windows, and modern comfort. 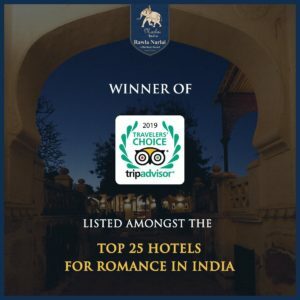 Luxury Grand Heritage: Innovative and lavish rooms with natural surrounding are available to enhance your pleasure for staying in one of the best Rajasthan Palace Hotels. Jharokha Rooms: You can experience old charming with modern facilities. Rooms are accessorized with the specific combination of wood, brass, leather, and latticework. Narlai Suites: You can feel the rustic ethnicity with highly stylish comfort of the modern era. These suites provide you with classic elegance including Luxury Hospitality. You can taste different delicacies of Rajasthani cuisine like Laal Maas, Gatte Ki Sabzi, Dal Baati Churma, Ker Sangria and so on. The Royal dining in the step well of Rawla Narlai is an unforgettable experience which may be a part of your Rajasthan tour. Lakeside Tea: Opting a trip to a closely located lake you can enjoy for staying in a Luxury tent accompanied with various kinds of migratory birds and natural beauty. Leopard sighting: Godward, rugged terrain, is the perfect habitat of leopards. If you are an adventure lover, you can experience a jeep safari in this region. To make an exciting tour including the experience of Royal architecture, culture and hospitality combined with luxurious comfort, you must have to come at Rawla Narlai Heritage Resort.